Honestly, a) I had never heard of Soap Nuts before a few weeks ago and b) the name kind of makes me giggle. So, what on earth are Soap Nuts?! 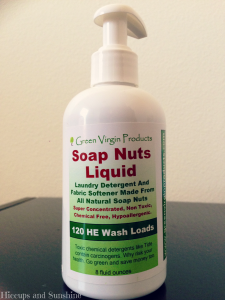 Soap Nuts are the only laundry detergent in the world that grows on trees! Fact! The Soap Nuts come in liquid form and are originally a berry shell that naturally contains soap. They grow on the Sapindus mukorossi (Soap Berry) tree in the Himalayas. I’ve been steering clear of regular household products for a while now. Have you seen the chemicals in some of them?! I am totally convinced that they do more harm than good. I’ve never actually EVER washed my son’s hair in commercial shampoo. I have used only water and a little coconut oil every now and then. He’s six. He doesn’t need L’Oreal products adorning his head. His hair is very clean and very shiny. Soap nuts worked wonders! I actually climbed into bed feeling relieved at not climbing into a bed of chemicals!